Fig. 1. Thomas Wilson (1824-1919), A.N.A. Convention photo of August 1909. Thomas Wilson (1824-1919), was born on December 7, 1824 at Montréal, Québec, Canada. In 1831, his family moved to Greenville, Quebec. His father was a merchant who opened various shops in Quebec and Ontario putting one of his sons in charge of each location. In 1858, Thomas moved to Clarence, Ontario, Canada, opening his own store. In 1860 he married Miss Mary Pridham (1829-1931), daughter of Alexander Pridham of Greenville, Quebec. They had two sons Arthur Ernest Wilson (1862-1951) and Sidney Wilson (1866-1935). His business flourished and made him wealthy allowing him to purchase virtually any coin he desired. He began collecting coins in 1870 and amassed one of the best collections of Canadian coins in the country. One of his early purchases was cited in The Canadian Antiquarian and Numismatic Journal of the Halifax Steam Boat Company Ferry Token won at the W. E. Woodward sale in November 1878 (not listed in Adams). Wilson retired in 1886 leaving his son Arthur in charge of the family business. He attended the ANA convention of 1909 held at Montreal and was one of two Canadian numismatists in their eighties at the time. The other being Mr. Adelard J. Boucher. He was made an Honorary Member of the ANA after the convention. The noted Canadian numismatist R. W. McLachlan, when writing an account on the North West Company Token reported, "The North West Token" is the rarest in the series, I only know of two specimens; one of these is in the collection of Mr. Thomas Wilson of Clarence, Ont., and the other is owned by Mr. Gerald E. Hart of Montreal." Wilson was a highly respected and influential Canadian numismatist, whose collection was purchased circa 1915 or 1916 by William Walter Coulthard Wilson (q.v.). MacLachlan also reported about only two known pattern pieces of VICTORIA DEI GRATIA REGINA CANADA : ONE CENT specimens one of which is owned by Thomas Wilson and the other in England. Mr. Wilson was born in Montreal on the seventh of December, 1825, and consequently is now 68 years of age. Mr. Wilson was only seven years old when his family left Montreal for Grenville, Que., where he resided about fifteen years. It was here at the village school that young Thomas pursued his studies. In 1848 the family removed from Grenville to Cumberland in Upper Canada, and several years later he went to Buckingham, in company of one of his brothers, settling finally at Clarence, Ont., where in 1858 he started in business for himself as general merchant. In 1860, he married Miss Pridham of Grenville, who is still living. They have three children, one daughter and two sons. In 1870, Mr. Wilson commenced a collection of Canadian coins, which to-day is perhaps only excelled by one other. Four or five coins are wanting, but taking into consideration the condition of each coin, his collection has no equal. 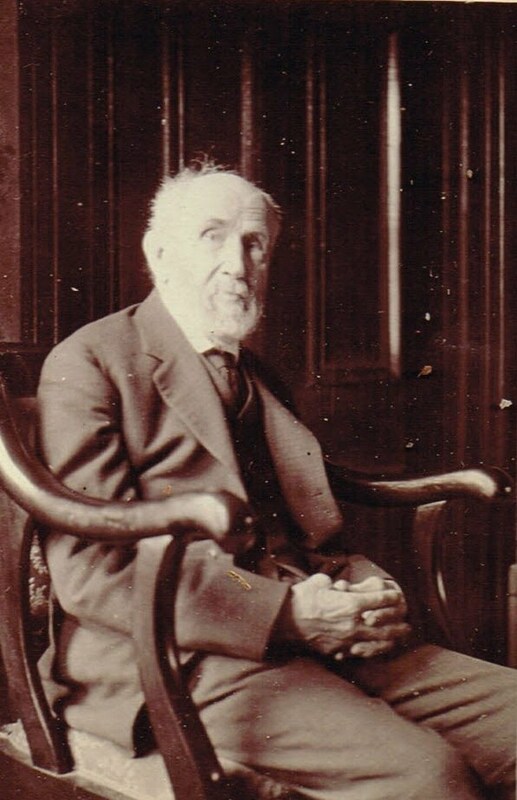 Mr. Wilson retired from business in 1886 in favor of his eldest son, Arthur, and the business has continued to increase under his able management." Quotation from Pierre N. Breton's biography of Wilson in Popular Illustrated Guide to Canadian Coins, Medals, etc., 1894, p. 227. Fig. 2. Thomas Wilson letter to the Chapman Brothers, Registered Black R in oval, Letter Postmarked Single arc Clarence; Split-ring, Clarence, Ontario, Canada, January 6, 1896. Franked by Canada Nos. 41 (SG 105) & 44 (SG 117), 3c vermillion and 8c violet black, the very rare Victoria Small Queen . Canadian postal rate of 11 Cents (very rare on cover to find 8c on non domestic). Backstamped Square Circle Precursor, Type II. Montreal January 7, 1896. Canadian Damaged Letter stamps purple D in circle January 8, 1896, the wax seal was broken off. 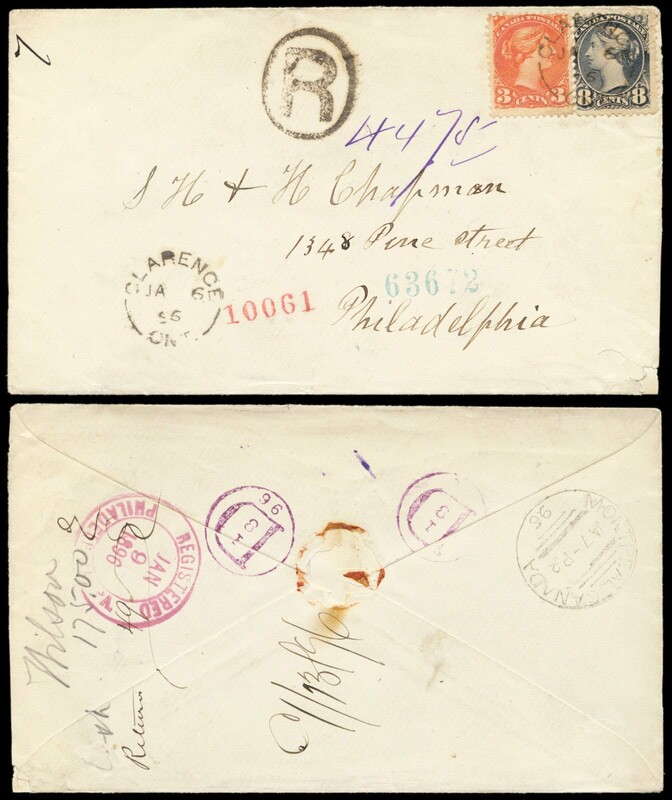 Philadelphia Registered Receiving Mark in Red-Purple ink January 9, 1896. Ex Pickering, Simpson $595.00; Saskatoon Stamp Centre Auction, 2015; $900.00 - $1,000. Courtesy of the Lupia Numismatic Library, Special Collection, Chapman Family Correspondence Archive. This numismatic correspondence of the then fifty-two year old Thomas Wilson was for a purchase of $224.00 in rare Canadian coins from the Chapman Brothers. The annotations on the back "cash $175.00 Return [receipt $] 49 [.00] O[rder] 1/13/96"
He died at the age of ninety-five on December 11, 1919 at Montréal, Québec, Canada. He died compared to his wife who died at the age of 102.